In the outer layers of the Milky Way is an old star, newly discovered by Johns Hopkins University astronomers, that might be one of the oldest in the universe. New research which will soon be published in The Astrophysical Journal describes a star with the mouthful of a name, 2MASS J18082002-5104378 B. It’s about one-sixth the size of our sun and dates back 13.5 billion years — just 300 million years younger than the entire universe. We know this star is so old because of its metal composition. 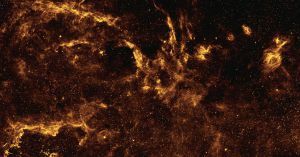 As stars die and their leftover materials form new stars, the nuclear fusion reactions that power their cores give off heavy metals like gold and platinum. The more heavy metals, the more generations a given star must have been through. But this star, still dimly twinkling, has such a small heavy metal content that astronomers think it comes from just the second generation of all the stuff in the universe — its celestial predecessor would have been formed in the Big Bang itself. For reference, our sun first emerged many generations after that, a 4.6 billion-year-old youngster compared to 2MASS. This star is far older than anything else found in our galaxy so far, and its discovery opens the doors to finding even older stars. That means we may soon learn more about how the Big Bang gave rise to the universe — and a better understanding of our own origins.